So while I was looking around their blog I noticed they were having a Design Team Call. So I decided to give it a try. 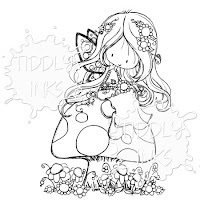 I used my new Tiddly Inks Fairy Happy Day Digi for my card. I am really loving the tiddly inks stamp as it was so much fun to color especially her long flowing hair. And I built a scene around her. I love making scene cards! To finish it off I put some little forest friends in there too to keep her company:)Thanks for stopping by!